The boat received a complete interior refit in 2013 and more updates in 2018. 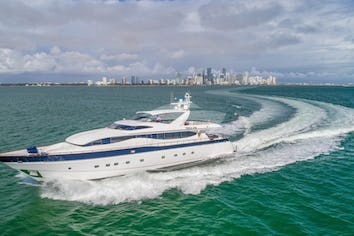 Accommodation is for eight guests in four cabins consisting of a main-deck master suite with a king size bed, a full-beam VIP suite, again with a king size bed, and two twins convertible to queen size doubles. All cabins have entertainment systems including flat screen televisions and all have full en-suite bathroom facilities. West Indian Green Lobster curry. Anis star scented basmati rice. Chef Raffie Lasagna serve with marinara sauce. Carrot cake with cream cheese and lemon icing. 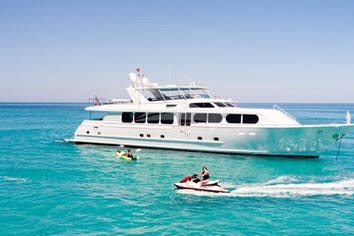 The CynderElla has it all…a tremendous crew,fabulous food, beautiful accommodations, and water toys for everyone! Captain Paul and his crew made us feel rightat home and safe at all times aboard the comfortable, well-designed yacht. They were always professional. They listened to what we wanted to experienceand made it happen. The Seabobs were somuch fun and the elliptical style stand up paddle boards were amazing. We hadnever seen such a thing and judging by the looks we received from everyone thatsaw us, they hadn’t either. It was a wonderful vacation for our whole family. A truly first-class yacht, the CynderEllaexceeds our expectations in every way. That’s why we come back every year. The food could challenge any five-star restaurant. We are overwhelmed with Captain Paul’shospitality. He knows all the bestplaces to visit, anticipates all our needs, and makes each trip a uniqueexperience that we will never forget. Tyler, Jack and Ashley also ensure that the boat is in tiptop shape atall times. We have chartered the CynderElla twice. They have been some of the best and mostrelaxing weeks we’ve ever enjoyed on vacation. The crew treats you like you ownthe yacht and the accommodations are the best we’ve experienced on any yachtwe’ve been on. There is nothing quite like enjoying a sunset on the water. Being aboard the CynderElla in the Abacos wasthe perfect way to spend a week. 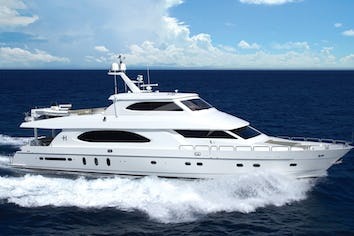 Theyacht is spacious and meticulous, while still being comfortable. Captain Paul and mates, Tyler and Jack, madeus the priority. Their attentiveness andefforts to meet our needs was above and beyond our expectations. Our fishing trips aboard the 30-foot GradyWhite “Reel Prince” will always be memorable. Fresh fish tacos are the best! I couldn’t plan a more perfectgetaway. From the moment we boarded, wecould tell this was going to be one of the best vacations we have had. Captain Paul runs an amazing yacht. He’s friendly, attentive, andaccommodating. He was focused on safetywhile still making sure we had all the fun and thrills we were after. The food is unsurpassed. All of our dietary requests were not onlymet, but Captain Paul and Ashley amazed us at each meal. Also, what better way to work off all thosemeals than using the elliptical and weights onboard! They have thought of everything you need forall the comforts of home. Ourcharter onboard the CynderElla was exceptional. The Captain and crew’s attention to detail was unrivaled. Captain Paul showed us some of the mostmagnificent places the Caribbean has to offer. While the crew, Ashley and Tyler kept everything inside and outsideimmaculate. It was the perfect place tounwind. We especially loved the fishingon the brand new 30-foot, Grady White Center Console. Every day onboard theCynderElla was a different adventure. Nomatter what we wanted to do Captain Paul and his crew found a way to make ithappen, all while keeping the boat in pristine shape and serving us meals tothe highest standards. We are lookingforward to our next trip!